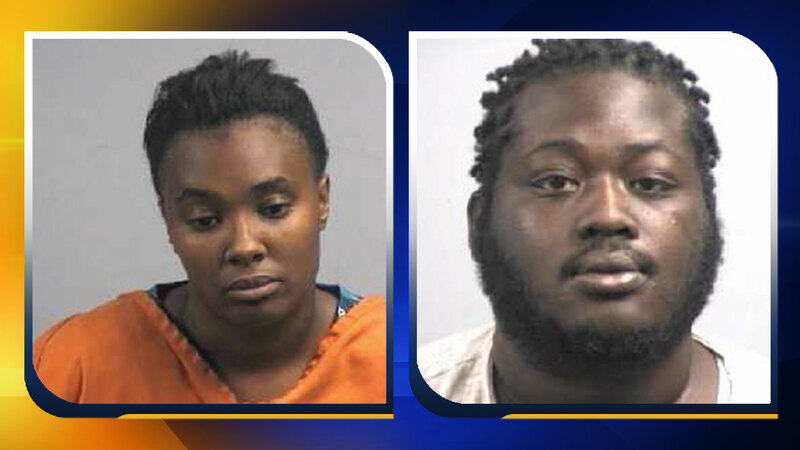 WAYNE COUNTY, North Carolina (WTVD) -- Wayne County officials have arrested two people accused of stealing from a man they previously lived with. Alexis Dominique Starkey, 23, and Breyon Naiijawon Starkey, 24, were arrested for crimes they committed on two separate dates. On June 9, a man the pair was living with called police to report a robbery. The victim told police that he suspected that Alexis and Breyon Starkey had stolen items worth $2,515. Several days later, on June 13, the pair showed up to the victim's home with a knife and things turned physical. During the struggle, the victim's cell phone was taken from him and a friend of the victim was stabbed on his back. The person who was stabbed was transported to UNC Wayne Memorial Hospital and treated for his injuries. The man was treated and released the same night. Alexis Starkey and Breyon Starkey are accused of larceny, possession of stolen goods, obtaining property by false pretense, robbery with a dangerous weapon, and assault with a deadly weapon inflicting serious injury. Alexis Starkey is being held in the Wayne County Detention Center under a $75,000.00 bond. Breyon Starkey is under a $82,500.00 for the five charges as well as an additional larceny and false pretense charge from another incident.